These plants have the remarkable ability to survive in a curled up, dormant, brown, dessicated state for years, and then open up and turn green with a bit of water. After returning to a lovely green, they go dormant again when their water source is removed, and can be revived again after dormancy. This cycle can be repeated for years. 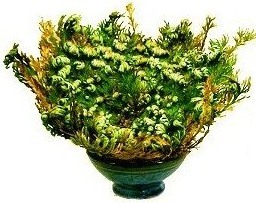 The Rose of Jericho, that flourishes every year just about Christmas Eve, is famous in Christian reports; which notwithstanding we have some reason to doubt, and are plainly informed by Bellonius, it is but a Monastical imposture, as he hath delivered in his observations, concerning the Plants in Jericho. That which promoted the conceit, or perhaps begot its continuance, was a propriety in this Plant. For though it be dry, yet will it upon imbibition of moisture dilate its leaves, and explicate its flowers contracted, and seemingly dried up. And this is to be effected not only in the Plant yet growing, but in some manner also in that which is brought exuccous and dry unto us. Which quality being observed, the subtilty of contrivers did commonly play this shew upon the Eve of our Saviours Nativity, when by drying the Plant again, it closed the next day, and so pretended a double mystery: referring unto the opening and closing of the womb of Mary. In any case, the plant is often kept dormant in the home -- sometimes handed down through the generations -- and brought out at Christmas time, along with the Christmas decorations, to blossom for a while and adorn the Christmas table, and then close, all symbolizing the opening and closing of Mary's womb. The plant is usually sold in its dormant state. There is no need to plant it in soil: simply place it in a bowl of water and it will open up and turn green within hours. Change the water daily, and when ready to put it away, just let it dry out for a week. Information from various websites indicates it can be kept green most of the year and used as an indoor plant, but that it should be allowed to go dormant periodically. Other names these plants are known by include: Resurrection Plant, Jericho Rose, Siempre Viva (meaning "Everlasting"), Spike Moss, and Dinosaur Plant.